His Fall 2017 womenswear was a monochromatic affair. Oftentimes, Yamamoto works strictly with the colour black. (He is famously quoted saying, “black is modest and arrogant at the same time. Black is lazy and easy—but mysterious. But above all black says this: ‘I don’t bother you-you don’t bother me.’”) The beauty in focusing solely on one colour is the ability to fashion a collection based on silhouette and cut. Here the silhouettes resembled Picasso paintings: they had multiple perspectives and looked different from every angle. Like a novelist would, Yamamoto challenged himself to establish new silhouettes and emotions. The shapes were abstract findings in his search for new silhouettes, new emotions. As he is considered a master tailor, it was fascinating to see him approach the new shapes. Newness is what pushes fashion forward. Designers either remix past tropes, rework them and present them in unseen ways or else they boldly brave uncharted terrain and create the new shapes. Few are confident enough to do it. The Kawakubos and Yamamotos of the world are rare examples, of those who will go out of their way to truly find something new, in a post-fashion way. It doesn’t have to be a recognisable item of clothing, why should it? 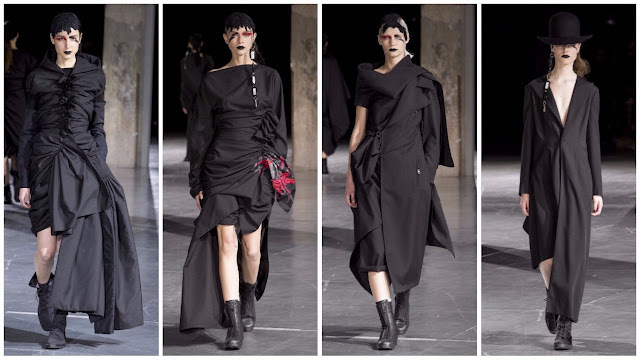 When you’re Yohji Yamamoto, a master tailor, and have been in the business for over three decades you created the game and you’ll play it how you like. He’s aware people blindly worship him and he dislikes that, hence with this collection he was seeking ways to rightfully inspire his audience.